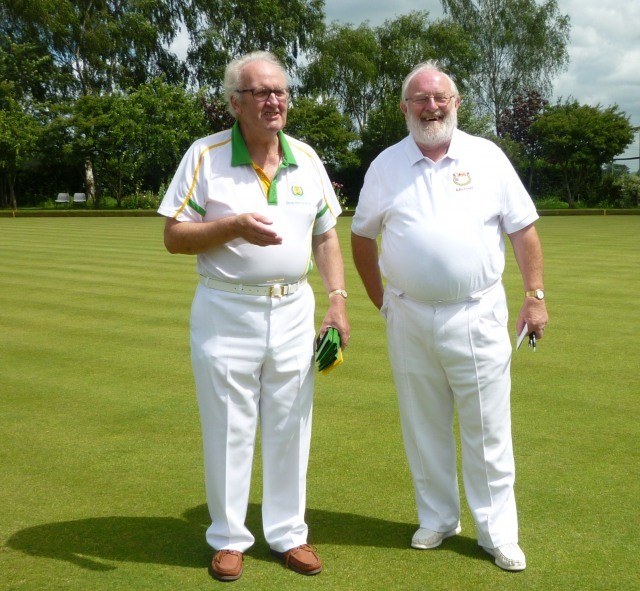 The Friends v Brimfield and Little Hereford B.C. 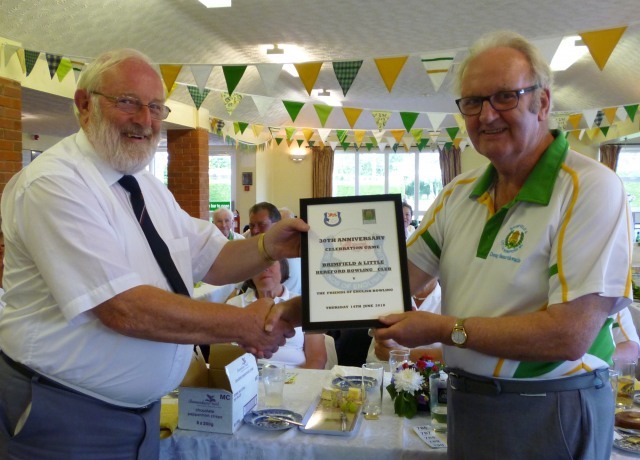 On Thursday 14th June the Friends journeyed to Brimfield and Little Hereford B.C to play their third and final game of the three day tour organised by our match secretary, Adie Lloyd. The threatened rain kept away and the sun came out to say hello and welcome. We entered the beautifully appointed club house to find a lovely buffet lunch waiting for us together with teas and coffees. After lunch we went out onto the green to play the celebratory match against the club, It was their 30th anniversary. 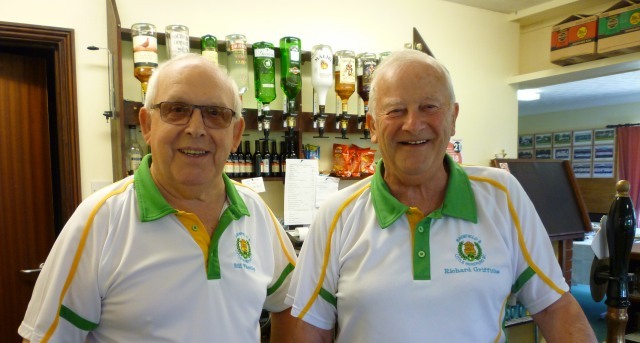 It is a thriving club with 60 members and they keep the club open all year with lots of different activities. Before the game a spider was held to raise money for the club’s charity. This was won by a member of the club. There was lots of laughter on the green and everyone seemed to be enjoying themselves. After the first few ends we were well down but then we got used to the fast green and clawed our way back and in the end we won on five of the six rinks. After the match we made our way back to the club house for a very good meal. Lasagna, asparagus and loads of different salads. This was followed by chocolate gateau or strawberries and cream. To finish an excellent cheese board. Judging from all the empty plates that went back to the kitchen we were all very happy with our meal. 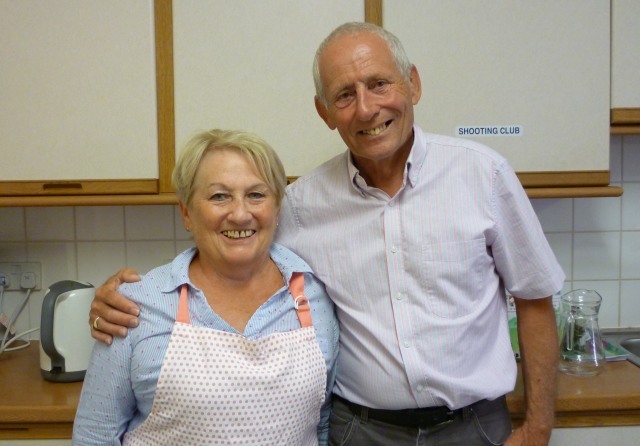 Our very grateful thanks go to Barbara and Stan for all their hard work with the catering. Their is no greater satisfaction for a cook then to see empty plates. After the meal the Chairman, Lester Bennett welcomed us all and thanked us for helping to celebrate their anniversary. Speeches were then made by Captain Doug and a reply by Adie. He explained that unfortunately Kay Kerley was supposed to be taking the game but had fallen ill. Kay had however given Adie some lovely boxes of mint chocolates to give out as rink prizes. Well worth winning – they taste superb. He also explained a little about what the Friends do and how they first started. Leaflets were on the table for those that wanted them. Membership of the Friends is open to any one who wants to join. We have lots and lots of fun and it is nice to put something back into the game that we all love and want to see flourish. Adie presenting Doug with a memento of the occasion. Days like this do not just happen and we really appreciate all the hard work that went into organising it. A very big thank you to all concerned and we are looking forward to celebrating your 35th with you.